Nick Foligno sent the text message on Sunday to his family members , promising an enjoyable evening of experiencing and watching the NHL playoffs. 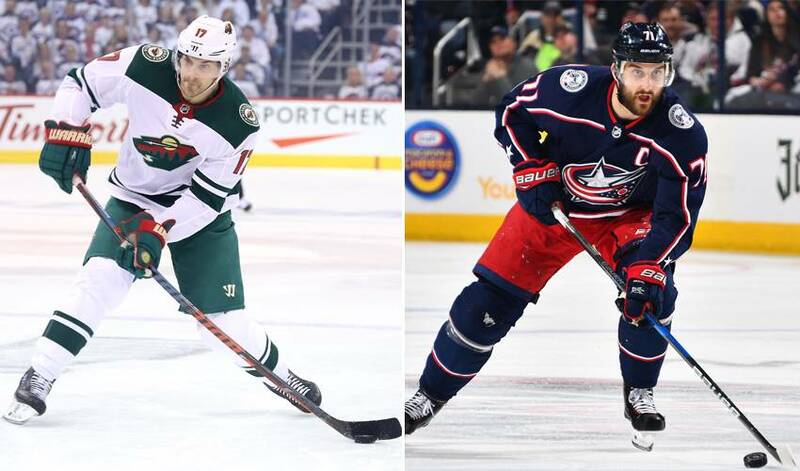 ST. PAUL, Minn. — Nick Foligno sent the text message on Sunday to his family members , promising an enjoyable evening of experiencing and watching the NHL playoffs. "This is going to be a big night for the Folignos," he tapped out on his smartphone. Make it a big week, actually. For the first time in the seven years they've been in the league together, both Foligno brothers are skating in the post-season. Marcus Foligno is getting his first taste, with the Minnesota Wild. Nick Foligno has returned for a third appearance with the Columbus Blue Jackets and his sixth overall. Their even-more-famous father, Mike Foligno, is having a blast as the unpaid consultant, proud pop and unabashed fan. "He's got no voice. He was yelling at the TV last night," Marcus said Monday, the day after he scored for the Wild in their win over Winnipeg in Game 3. "With him playing, I think he still gets that energy, gets that adrenaline pumping, when he sees us play." Mike scored 247 times over 15 seasons in the NHL, making his mark during a full decade with Buffalo when he celebrated goals with a signature two-legged leap straight up in the air from the ice . Marcus started his career there, too, in 2011 before the Sabres traded him to Minnesota last summer . Nick debuted in 2007 with the Ottawa Senators until being dealt to Columbus in 2012. "We're trying to do something special here as a family," Nick said after the Blue Jackets beat Washington in Game 2, "and it's been pretty cool." They're dearly missing a critical member of the clan. Janis Foligno, the mother to Nick and Marcus and their two sisters , died in 2009 of breast cancer. The boys have kept her memory alive through their performance on the ice and their philanthropy off it, with a foundation in her name created to fight the disease and support cancer victims. Nick and his wife also donated $1 million to children's hospitals in Columbus and Boston, where their now-4-year-old daughter had a congenital heart defect repaired. So they play on for a greater purpose, with Mike keeping a keen eye on the boys. "There are always things to do better. He sees it. He watches the game. He scouted for a long time, and he coached for a long time in the league," Marcus said. "He just knows how we're capable of playing, and that's the biggest thing. He wants us to be the best players out there and be the best role players for our team." Nick has long had the more prominent role, as a first-round draft pick and now the captain of the Blue Jackets whose profile in the community includes pizza commercials and charitable endeavours. His 33 points was his lowest total in five seasons, and he missed time with a lower-body injury, but the 30-year-old's versatility to play centre or either wing spot on any of the first three lines has been ever valuable to coach John Tortorella. Marcus has been more of a niche player. He had a career-high 13 goals and a career-most 80 games for the Sabres last season, but after arriving in Minnesota in a trade last summer his adjustment at age 26 to a deeper team and a lesser role took several months. It included some healthy scratches. "We all want to score 30 goals and be impactful," coach Bruce Boudreau said, "but he's got a four-year deal so in time he'll get into that situation." The Wild trail the Jets 3-1 entering Game 5 on Friday, but their trouble has mostly been an unproductive series by some of their skilled forwards playing more minutes. Playing on the fourth line with Daniel Winnik and Joel Eriksson Ek, Marcus has found a groove down the stretch of the regular season and into the playoffs. "Whether it's 10 or 12 minutes, he gets out there, he plays really hard, and he's been very effective," Boudreau said. Which brings us back to that Sunday prediction of a big night for the Foligno boys. Marcus became a major figure in Game 3 for the Wild with a goal and his collision at the boards with Jets defenceman Tyler Myers that knocked his former Sabres teammate out of the game with a lower-body injury. Nick and the Blue Jackets, who lead their series 2-1 entering Game 4 on Thursday, won in overtime about an hour later. Nick was sorry to have missed the goal by Marcus, but he was elated to hear his proclamation came true. The brothers communicate almost daily, providing tips for each other along with standard pick-me-ups and sibling ribbing. After Nick took a puck to the face in Game 1, Marcus teased him by reminding him that goalie Sergei Bobrovsky was the one paid to get in the way of the pucks. "You don't realize how special it is, but I raced back after dinner to watch your brother play in the playoffs," Nick said. "It's a pretty cool feeling." AP Hockey Writer Stephen Whyno in Washington and AP Sports Writer Mitch Stacy in Columbus, Ohio, contributed to this report.